Robert Winsor: "Chase your dreams, build your team, protect your reputation and learn from your mistakes"
When Bob Winsor was a two-way player on the 1960s national champion McGill Redmen football team, he learned the importance of discipline, dedication and having a game plan. On Oct. 29, the business leader, engineer and innovator laid out his game plan for success for the graduating Class of 2014 during his Convocation address, after he was awarded an honorary Doctor of Laws degree. When Robert Winsor was a two-way player on the 1960s national champion McGill Redmen football team, he learned the importance of discipline, dedication and having a game plan. On Oct. 29, the business leader, engineer and innovator laid out his game plan for success for the graduating Class of 2014 during his Convocation address, after he was awarded an honorary Doctor of Laws degree. Winsor, the owner, Chairman and CEO of Holden America Group (a group of companies that specializes in designing equipment for railway freight transportation), outlined his four-point plan to graduating students – chase your dreams; build a solid team; build your reputation; and learn from your mistakes. “Adopt the work/life mission of Go For It,” said Winsor. “The ‘It’ is your choice and yours alone. It is what you want to do in life and hopefully something you are passionate about. Winsor stressed that thinking outside the box meant growing your job even when not required to do so. “Build [your job] and grow it to include elements that were not included in the original job description. Keep adding little bits to the edges,” he said. “Make yourself increasingly more helpful for your team as well as your employer. Winsor’s second piece of advice – building a team – emphasized the importance of accepting one’s own weaknesses in order to learn from others. “It’s not easy for most to advance quickly through life without constant help, whether that be from supervisors, reporting personnel or other personnel,” said Winsor. “It really helps to be surrounded by those who have all the capabilities and talent and skills that you don’t have. Winsor also stressed the importance of an individual’s character in business. “Build your reputation. It is something you just can’t shake,” he said. “Build it carefully and guard it rigorously. Remember, this is your introduction to the world, it will be repeated by those who know only your reputation and not you personally. The key, he stressed, was turning an error into something positive. “The good news is, you can – and should – learn from those mistakes. This is the most effective form of continuing education you can find. [There are] no classes to attend, its cost free and it takes no time. 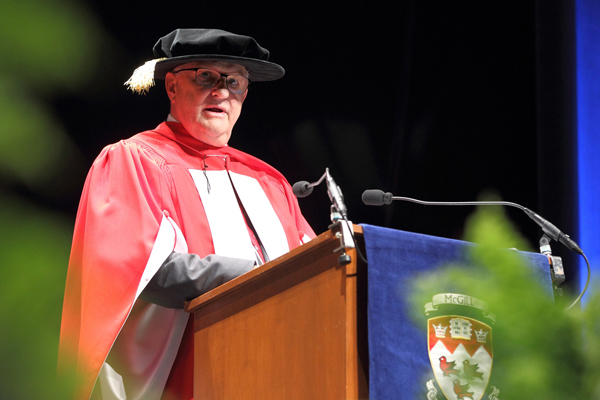 Watch Robert Winsor’s Convocation address below.